I just found out today that you can juice greens. I've had a juicer sitting around for years, unused, while I struggle to use up huge quantities of kale and spinach and other fun leafy things. Now I know that I don't have to worry about wasting greens with a CSA share. I can juice 'em! You know the Mimomex squash blossoms and zucchini wouldn't go to waste, and their famous peppers are inspiring. But I've heard stories from other people who have been members of long-time CSAs, and those stories are scary. Opening the refrigerator and being stared down by bunches of kale and swiss chard is intimidating, but stuffing them into a juicer is satisfying. Bring 'em on, I say. Thankfully, there are a few shares (full and half) still open in the Sunset Park CSA. Payment in full is due at the end of May (okay, June 1st), but of course it's encouraged before since the deposit date passed at the end of April. 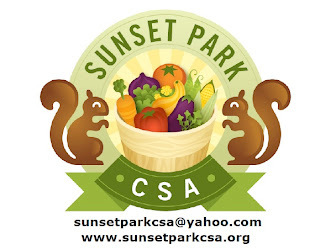 Check out the Sunset Park CSA website for downloadable FAQs and membership information. You can also see previous posts about it here. The Mimomex produce is naturally grown, and it's pesticide free. The pick-up is on Wednesday evenings at St. Michael's. Fruit and egg shares are available for an extra cost. Each share volunteers a couple of hours; you get to meet your neighbors! Come on, you'll like it. Everybody else is doing it. Think of chard as the Italian spinach. Any recipe that calls for spinach can use chard as a sub. I like to steam it and serve as a side dish with a little butter, olive oil, salt and balsamic vinegar. I was skeptical of chard at first, but my lover convinced me to try planting it one year, and now I've got four rows going. If you're on 8th ave, head over to the Hong Kong grocery, buy firm tofu, coconut milk, and curry. This makes an excellent Palak Paneer without the dairy for you vegans, and it'll clear out whatever remaining chard you have in the fridge. I'm still working on Kale. Truth to tell, one really needs the right cultivar. I did a single row this year of a new type, and we'll see how that plays out. I suspect the juice would be a bitter brew, but I've never tried it. The short answer is Community Supported Agriculture. A much better answer is on www.sunsetparkcsa.org. It's a way for those of us who live in urban areas to get very fresh (picked that day fresh) produce while supporting farms within a tight radius.